(Nanowerk News) A study into the way nanoparticles scatter light could lead to simpler and smaller optical nanoantennas with improved directivity and efficiency — crucial components for the next generation of advanced photonic devices ("Optimum Forward Light Scattering by Spherical and Spheroidal Dielectric Nanoparticles with High Refractive Index"). Boris Luk’yanchuk and co-workers from the A*STAR Data Storage Institute together with a collaborator in St. Petersburg University, Russia, undertook a detailed numerical investigation of the light scattering characteristics of dielectric nanoparticles of different shapes with high refractive indexes (larger than 2). They focused particularly on nanoscale spheres and spheroids. By carefully selecting the nanoparticle’s shape and refractive index, the team discovered they could use the interference between the particle’s electric and magnetic dipole resonances to control and optimize the strength and direction of its light scattering. For example, they found that for a spheroid particle with a refractive index of 3.5, scattering in the forward direction can be maximized if the spheroid’s major axis is just over twice the length of its minor axis. Steering the flow of light by manipulating the nanoparticle’s aspect ratio is potentially useful in many applications, for example to maximize the light captured by a solar cell or to make artificially-engineered metasurfaces that can cause light to flow in interesting and unusual ways. 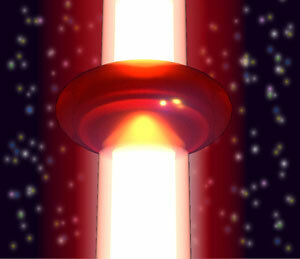 “Dielectric particles with optimized shapes which behave as very efficient directional antennas can be used in sensing devices, transmission lines, metasurfaces with numerous uses and in many other devices such as negative refractive index lenses, optical cloaking devices or nanolasers,” explained Luk’yanchuk, the lead researcher in the study. According to Luk’yanchuk, the physics of this scattering is valid and scalable across the electromagnetic spectrum and thus their approach could be applied not only at optical and infrared frequencies, but at microwave frequencies as well, provided that suitable transparent particles with a sufficiently high refractive index are used.